Here you can see how the older, lower flowers on the Dutchman's breeches go to fruit more quickly than the upper flowers. Watch how the "pants" wither away, revealing the ovary containing developing seeds. Today I'm participating in the "Today's Flowers" meme, for more flower images, go here. For those of you from around the world that aren't familiar with this plant, it grows in rich woodlands mostly in the eastern North America, although there are disjunct populations in Oregon, Washington State, and Idaho. This flower blooms in the spring time before the trees towering above it get their new leaves. very beautiful flowers, i love the stunning white sprays of this dicentra, are these wild? Yes, I took this shot in a natural area here in Columbus Ohio, this is a native Ohio wildflower. They're so lovely. I keep hoping to stumble upon some of these someday, somewhere, but no luck so far. Oh, I wish I had some of these in the woods nearby. Wonderful photo! Hi Tom, welcome to Today's Flowers. So happy you joined in. I am sorry it's taken me a while but I am trying to catch up today. You have introduced me to something new, thank you. 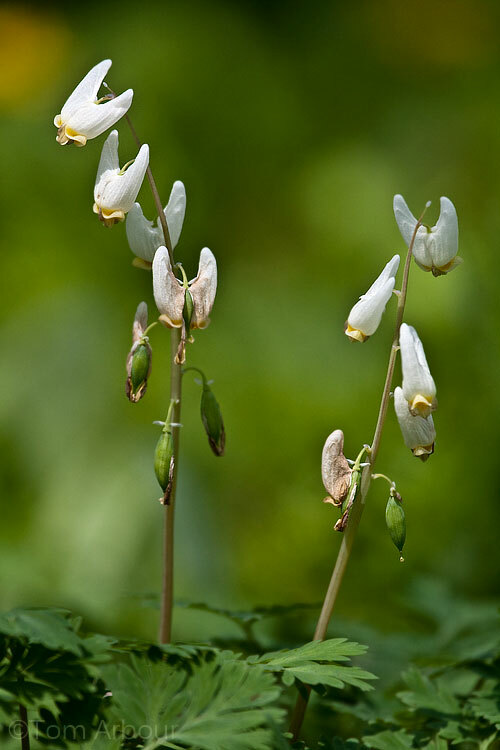 I have never come across these Dutchman's Breeches before and they are fascinating. Wonderful flower and a great photo!